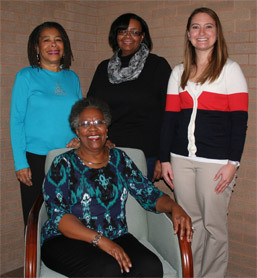 Black Diamond members are (sitting) Adraine Howell of Monongahela, (standing from left) Jennifer Frazier, of Monongahela, and Karen Perry, of Belle Vernon, with MVH Director of Fund Development Melissa Marion, of New Brighton. The Black Diamonds donated $500 from its annual Holiday Celebration on Dec. 7 to Monongahela Valley Hospital's Charles L. and Rose Sweeney Melenyzer Pavilion and Regional Cancer Center. The Black Diamonds formed in 2007 to empower women, youth and families by supporting educational and professional growth to foster new leadership for tomorrow. The group's annual Holiday Celebration assists an organization, group or individual that can benefit from additional financial support. The group moves the event to a new community each year, which members say has helped the event grow in popularity. More than 140 people attended the latest semi-formal event at the Monessen Firemen's Social Hall with door prizes, a DJ and a silent auction.